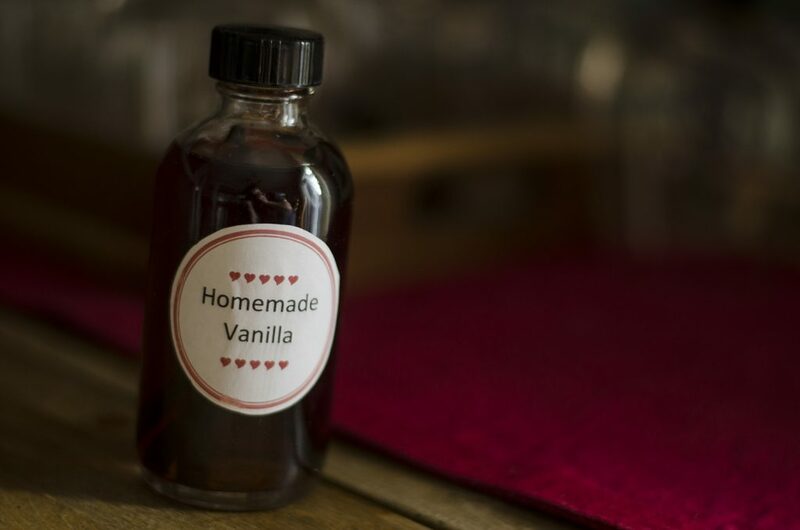 A bottle of homemade vanilla. Since you are using only two ingredients, it’s important that they are high quality. Good quality beans are definitely important. I used Bourbon vanilla beans which have a traditional vanilla flavour. There’s also Madagascar, Tahitian and Mexican all with their own unique flavour profiles. If you aren’t able to find good quality beans at your local grocer, they can easily be ordered online. The size of the jar will determine how many beans you use. For my small 4 ounce bottle I used 2 beans. Cut the vanilla beans to fit the size of your jar, then split the vanilla bean by cutting length wise. You’ll have flecks of vanilla in your extract but I don’t really mind and love the way it looks. If you want a clear extract just use a cheese cloth to strain the extract. Use a small mason jar to add the ingredients to. I ordered small bottles, added labels to mine and handed them out as gifts for Christmas one year. Since then, I haven’t used store bought vanilla. That was 6 years ago. Vodka is the alcohol of choice here because it has the most neutral flavour, but that doesn’t mean you can’t experiment with bourbon, brandy or even rum to create a more unique extract. Pour the alcohol over the beans until they are fully submerged. Seal the jar with a lid, give it a couple shakes and store in a dark, cool place. Let the beans sit in the alcohol for about a month to fully infuse. After the extract has infused, give it a taste. If you think there’s just not enough vanilla-ness in there for you, add a few more split beans. Whenever I’m a little low, I just top up with vodka. After some time, if the colour looks a bit diluted I replace the vanilla beans with fresh ones. Don’t throw those old beans out. You can dry them out and add them to sugar to make a lovely vanilla flavoured sugar.